I've been thinking and praying about the economy as well as our mission as people of God and I wanted to share a few brief thoughts here. With all the finger pointing going on today, especially regarding the economy, the thought came to mind that as believers, the only finger pointing we should really be doing is Pointing People to Jesus Christ. Don’t get me wrong, the economy is important and a complex topic however, eternity with Christ trumps the economy as the economy is a “momentary light affliction” in the big scheme of things. Let's work hard to be good stewards of what God has given us in our personal lives, through the corporate world, and in our government. I share this because I firmly believe that some of the solution to what is currently taking place starts with us managing our finances better than we have been, amen!? We need to seriously evaluate our own spending habits and make sure to ask God for help to direct our spending of what He's given you and I. We need to put Him first and give of the first fruits of our labor and He'll help guide us on how to manage the rest as we actively seek Him on this. Let’s be a light in the darkness as we shine out His light to all those around us. Let’s be His ambassadors and not stuffy self-righteous/Bible thumping people. The truth is important but no one needs to be hit over the head with it nor will we be as successful in reaching people for Him if we only take that approach, amen? Let us instead be the encouragers and the encouragement people need in these uncertain times, and let us make sure to speak the truth in love and be ready to share the hope that we have through the salvation we know through Jesus Christ's sacrifice. Let's work hard and be excellent workers, co-workers and employees as this will also glorify God as well as make the team we work with and ourselves even more successful. Let’s meet the hurting and disconnected right where they are. Let’s pray for others and each other like never before because effective prayer is powerful! Let's get in the Word and stay in the Word daily or as regularily as possible. How are you doing during these dark economic times? Are you seeking Him and trusting Him? Or, are you trying to rely only on your own “wisdom”? 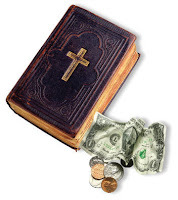 What does the Bible say and teach you about finances? Are seeking God and studying His Word to see what He has to say about "your" finances? Are you putting into practice any financial principles you are learning or have learned through the studying Word or through something like Financial Peace University? Some things to think about – thanks for stopping by, reading this post and letting me share from the heart. Would love to hear your thoughts so if you have time, please leave a comment especially in regard to how you're managing things during this period of time. Maybe you have some tips or pointers to share with others? Share them here. Tips on frugal living? Share them here to the benefit of all who may visit. Are you "Going through the motions?"